Tessa Longbons | May 2, 2018. Kansas released its preliminary abortion report on the Kansas Department of Health and Environment website in April 2018, becoming the fourth state to publish its report for data from 2017. The report shows that while abortion in the state is falling, Kansas continues to be a destination for out-of-state women seeking abortion. Information on Planned Parenthood’s Kansas market share is not publicly available. Kansas reported 6,782 abortions in 2017, including 33 abortions procured by Kansas residents in other states (Fig. 1). Abortion continued its gradual decline, dropping by 0.6 percent from 2016 and by 39 percent from 1996, the first full year after abortion reporting became mandatory for all medical facilities. However, while abortion totals are falling, chemical abortions are on the rise. There were 3,940 chemical abortions reported by Kansas in 2017, up nine percent from 3,623 in 2016. During 2017, chemical abortions made up 58 percent of the state total. 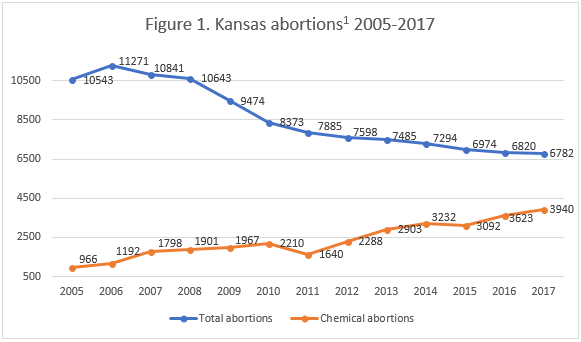 Chemical abortions increased by over 875 percent from 2000, Kansas’ earliest full vital statistics report to be published on the department of health website. 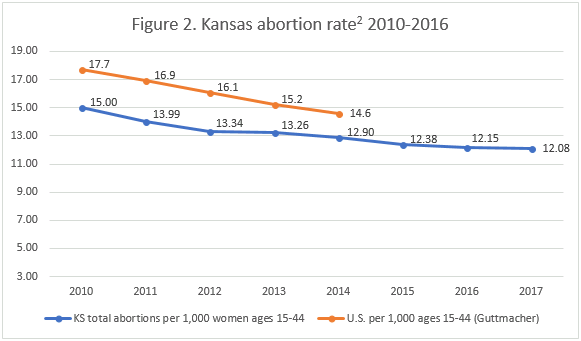 Although Kansas does not report the state abortion rate, CLI estimates that from 2016 to 2017, the rate decreased from 12.15 to 12.08 abortions per 1,000 resident women ages 15 to 44 (Fig. 2). Kansas’ abortion reports include all abortions occurring in the state plus abortions performed on Kansas residents in other states. Just half of the women getting abortions in Kansas were residents, with the other half of women coming from out-of-state to procure their abortions in Kansas, and an additional 33 Kansan women getting abortions in other states. The reported number of Kansas residents obtaining abortions in different states may increase as more out-of-state forms are received by the Kansas Department of Health. Eleven percent of the abortions reported by Kansas were performed on girls age 19 or younger, 19 of whom were under the age of 15. The largest age group was women in their twenties, at 58 percent of abortions. Twenty-eight percent of women were in their thirties, and four percent were age 40 or older. Over half of all abortions (56 percent) were performed on non-Hispanic white women, followed by 23 percent performed on non-Hispanic black women and 13 percent on Hispanic women. Eighty-four percent of women were unmarried, while just over a thousand women were married, and 49 did not report their marital status. Almost one-third of the abortions reported by Kansas, 31 percent, were performed on women who had no previous pregnancies. Forty-two percent had no previous live births, while 23 percent had given birth once and 35 percent two or more times. More than two-thirds of women had never had an abortion before. Twenty-one percent had one previous abortion and 11 percent had more than one. Kansas is one of only a few states to report previous miscarriages to women who get abortions; 84 percent had never had a miscarriage, compared to 13 percent who had one previous miscarriage and four percent who had at least two prior miscarriages. A majority of abortions – 68 percent – occurred at less than nine weeks of gestation. Twenty-one percent were performed between nine and 12 weeks, and six percent were performed between 13 and 16 weeks of gestation. There were 289 abortions performed between 17 and 21 weeks, four percent of the state total. Ten abortions were performed after 22 weeks of gestation, or approximately five months. Kansas prohibits abortion after 22 weeks of gestation, more than halfway through pregnancy, unless the life or a major bodily function of the mother is in danger. All ten of the abortions at this gestational age were performed on Kansas women in other states. In cases of abortion after 22 weeks of gestation, Kansas doctors are required to report why the abortion was necessary and whether the baby was viable. However, this information was not available for the 10 abortions after 22 weeks because the abortions were performed in other states that did not report these data to Kansas. Kansas law requires certain individuals who work with minors, including health care providers, to report any cases the individuals encounter of emotional, physical, or mental abuse or neglect. Twenty-six of these reports were filed by abortion centers during 2017. Ultrasounds were used to determine gestational age before 6,749 of the total 6,782 abortions (99.5%). According to Kansas’ informed consent law, when an ultrasound is performed, a woman must be allowed the opportunity to view the ultrasound and obtain a copy. The doctor must ask the woman to sign a statement accepting or rejecting the offer to view the ultrasound, but the abortion report does not indicate how many of these 6,749 women took the opportunity to view their ultrasounds. Kansas reports a higher percentage of nonresident abortions than any other state. In 2017, only half of all the abortions that occurred in Kansas were performed on Kansas residents. Forty-seven percent of all abortions reported by Kansas were performed on women from Missouri. Missouri reports a large number of women who seek abortion in other states, but its reports do not indicate why so many Missouri residents travel out-of-state for abortions. Kansas prohibits abortion at approximately 22 weeks of gestation (20 weeks post-fertilization), while abortion in Missouri is legal until viability, which is usually around 24 weeks of gestation. However, Missouri requires a 72-hour waiting period after a woman has received informed consent materials, while in Kansas the waiting period is 24 hours. It is possible that some Missouri women choose to get abortions in Kansas to avoid Missouri’s longer wait. Additionally, for a few years Missouri had just one abortion center – run by Planned Parenthood – after others closed due to failure to meet state requirements that physicians at abortion facilities have admitting privileges at local hospitals. That requirement is currently blocked by a federal court ruling and a second Planned Parenthood center has begun performing abortions, but plans to offer abortions at additional sites may have been put on hold due to new Missouri standards for abortion-providing facilities. Some of the influx of out-of-state women to Kansas may be explained by successful pro-life protections in Missouri, reinforcing Charlotte Lozier Institute scholar Dr. Michael New’s findings that pro-life legislation leads to lower abortion rates in the states where it is enacted. In 2016, Charlotte Lozier Institute conducted a study of abortion reporting across the 50 states, the District of Columbia, and New York City. Kansas’ reports tied for 15th best. To enhance its reporting, Kansas could request more information from the doctors and facilities that perform abortions and make sure to report all the data it collects. Currently Kansas collects, but does not report, the levels of education of women who get abortions. Kansas does not record information on the facilities where abortions take place or any resulting complications. The state also does not request women’s reasons for choosing abortion or report whether women were using contraception at the time they became pregnant, as some other states do. Recently, Kansas improved its informed consent process, requiring abortion clinics to provide each woman with information about the experience and employment history of the doctor who will perform her abortion. However, Kansas includes no information on informed consent or parental consent in its reports, including whether women took advantage of the opportunity to view their ultrasounds. By adding more information to its annual abortion report, the Sunflower State could make it easier for Kansans to track the effectiveness of its pro-life laws. Kansas abortion totals include in-state resident, non-resident abortions, and out-of-state resident abortions. Numbers were taken from Kansas’ vital statistics reports except for 2017, which was taken from the preliminary abortion report. Kansas does not report the state abortion rate. Rates were calculated by the Charlotte Lozier Institute using population estimates from the United States Census Bureau. The rates were calculated using the following formula: (total number of abortions performed in Kansas ÷ number of resident women ages 15-44) x 1,000. Numbers were taken from the vital statistics reports except for 2017, which was taken from the preliminary abortion report. The rate for 2017 was calculated using population estimates for 2016, the most recent year available.